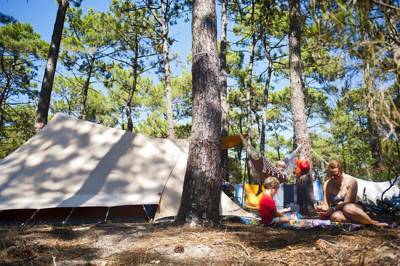 This lakeside campsite in the dunes of South West France is within walking distance of the beach and has a range of camping pitches and glamping options. Book now. Regular camping pitches, furnished safari tents and luxury yurts can all be booked in this wooded campsite overlooking the Ardèche River. There's an excellent café and pool and it's a short stroll to the waterside. Luxury safari tents make for an easy family break at this garden-like site near Bergerac. Breakfast is included, there are bikes to borrow and oodles of activities for kids. Book now. Floating on a tranquil lake, two wooden cabins each sleep a family of four comfortably. You can fish from the row boat, explore the lake by canoe or simply lounge on the sun terrace. A fresh breakfast is paddled out to you each morning. Book now. Deep in the heart of Parc Livradois Forez, this green glamping site has an alpine feel. Luxury yurts make a romantic setting for two or a cosy family abode. Campfires, bush craft and the wild setting all make it a top choice for children. Book now. La Blanquette's vintage caravan and accompanying wooden cabin make a perfect alternative break for travelling couples. Cosy, romantic and decked out in a retro style, it's an ideal spot for escaping half term crowds. Book now. Within driving distance of the coast, this large but secluded site has a fishing pond, swimming pool and heaps of family facilities. The inland location adds to its tranquility and quiet local roads are ideal for cycling. Book now. On the banks of the River Isle and within walking distance of a grand, 12th century château, Camping La Chatonnière offers back-to-basic camping with easy wild swimming access. Pitches start from just €14. Book now. A few miles from Tour on the fringes of the Loire Valley, this eco-conscious woodland campsite has a swimming pool and on-site restaurant overlooking a lake. Pitches vary from small wild spots to larger family emplacements with a great range in between. Book now. In the hills of South East France, this expansive campsite within a wooded nature reserve, has plenty of spaces and plenty of options too: Tents, campervans and caravans are all welcome, while luxury safari tents are available to rent. Book now. On the banks of the Aveyron, this unspoiled site has just 33 pitches, so be sure to book early if you're planning a summer break. Wild, natural and with easy access to the river, it's a favourite for traditional tent campers. Book now. There are a dozen châteaux within driving distance of this aptly named campsite in France's Loire Valley. The family focused, riverside spot takes campers, caravanners and glampers too, with heaps of facilities. Pitches cost from €15.50 for two people. Book now. With the Pyrénées in one direction and the Atlantic coast in the other, this well located glamping site features six striking geo-domes. Children sleep in hanging pods and a swimming pool, playground and bar make it popular for families. Book now. Giant pitches and an on-site nature reserve make this South France site stand out. Despite the size, pitches numbers are limited to ensure space and, if you don't fancy camping, there's a luxury tree house too! Book now. Terrific valley views, a peaceful vibe and the friendliest of hosts keep visitors returning to this Dordogne campsite, a favourite on the Cool Camping website from the early days. Book now. Safari tents, bell tents, cabins and regular camping are all available options for a half term break at Pré Fixe in the south of France. Popular with families, there is a large playground and swimming pool. Book now. Peaceful tent pitches are joined by safari tents and a romantic, refurbished gypsy waggon that's still available over the hlaf term break. Campfires are permitted, groups are welcome and the river Loire is within stroll distance. Book now. A short drive from the North Brittany coast, this traditional camping site is just 20 minutes from Mont St-Michel. There's a swimming pool, bijou café-bar and a playground for little'uns. Easily accessed from the ferry port. Book now. This small Limousin campsite has just six grassy pitches so advanced booking is essential. The pleasant setting is matched by a fabulous on-site restaurant and there is a swimming pool and activities for children. Book now. 20 grass pitches, a wooden chalet and luxurious safari tents are all available at this fruitful site in the south. Apple trees and sunflower fields surround the camping area and there's excellent communal BBQ on weekends. Book now.